Large Villa Properties Accommodation suitable for Large parties groups in Italy in Campania Umbria Lombardy Lake Garda, large Italian Villas. Each room at this family-run property overlooks the surrounding hills and mountains. They are all spacious and air conditioned and come with wood-beamed ceilings and satellite TV channels. Some also have a four-poster bed. At the restaurant you can enjoy Umbrian specialities and wines, along with classic Italian dishes. Breakfast is continental style and includes fresh croissants, cold cuts and cheese. Valle Rosa Country House is a 20-minute drive from Terni and Foligno. Just 50 metres from shallow-water beaches ideal for children, Hotel Club Sabbiadoro is a large, modern complex with marine-style décor and a dominating blue-colour theme. Every room offers comfortable furnishings and amenities, and most rooms have a panoramic balcony with sea views. Surrounded by pinewoods, Hotel Club Sabbiadoro features 3 bars, 2 swimming pools, and a private beach. There is an entertainment programme for the whole family that includes a children’s mini club, a piano bar, and day and evening events. You can relax in the hotel’s fitness centre, or play a variety of sports including table tennis and bocce. Business services include a free shuttle service for companies, office services, and various meeting rooms. Hotel Club Sabbiadoro offers many facilities, such as free Wi-Fi and free parking. There is a delicious buffet breakfast every morning and you can savour regional cuisine during lunch and dinner in the hotel restaurant. Italy Group Accommodation. Above are group accommodation. situated in Brescia Lombardy Italy Close to Lake Garda. Use scroll bar to see more Group villas. Apartments at OasiMaremma Village come with satellite TV and fully equipped kitchen. Each apartment has a private patio complete with table and chairs. A free internet point is available in the lobby. The à la carte restaurant has a terrace overlooking the pool and serves traditional Tuscan cuisine along with local wines. During the summer, the resort runs a free shuttle service to the beach. Guests can use beach facilities at discounted rates. 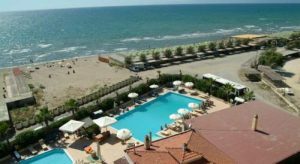 OasiMaremma is 4 km from Scarlino Train Station, and a 10-minute drive from the SS1 Aurelia national road. Parking is free. Italy Group Accommodation. Italy is a great holiday destination any time of the year for Larger parties and groups looking to stay in Larger group accommodation property that is ideal for theses Large groups or Large families and with one of our holiday homes in Italy you have the freedom to tailor your vacation to meet your needs. If you’re a fan of cultural holidays, a centrally-located holiday home in Italy,. A self-catering holiday home in Italy is ideal if you want to make the most of a culinary holiday in Italy while a holiday home in the mountains of Italy is perfect for the more adventurous holidaymaker. Don’t delay. Book now pet-friendly holiday homes in Italy and let every member of the family enjoy the holiday they deserve! Holiday homes . Click in for Funny’s Unusual Photos’ Jokes a few are sometimes near the knuckle be warned. New ones are added each week. Take A Break Holidays takeabreakholidays, Large Villa Properties. San Francisco De Asis, Urb Marina, San Fulgencio, 03177, Alicante, Spain.